This quote comes from Scott Thornbury’s Twitter account, and is apparently part of a new book he’s working on. I figure it deserves a bit of unpacking. "I used to teach maths in England, which is why I pluralize it"
"I used to teach younglings before Anakin killed them all"
"I teach criminal law to convicts"
"I teach 3rd years Defence Against the Dark Arts"
Thornbury’s quote refers to direct objects, not indirect objects, so it can’t be this last one he has a problem with, although there are reasons explored below why this argument structure is a bit problematic. Having a problem with learners as direct objects of “to teach”, on the other hand, doesn’t really make sense except when you assume unflattering things about the word “teach” itself. This post is a list of things that annoy me dressed up in academic finery. Postgraduate education lends both credence and specificity to Internet grumblings, but sometimes does very little for employability. Native speaker (NS) teachers in Japan are partially, or primarily depending on the job, hired as models of the ideal English user. Now, a lot of us reject this idea for many good reasons, but you can expect students to embrace and even to be highly motivated by it. My thinking is that teachers should be mindful of the fact that native-like proficiency is an unrealistic goal for most students, but also that NS and other fluent speech is full of teachable points which, when explored in class, may yield benefits for students other than their coming to sound just like you. With that in mind, I’ve been cataloguing various ways in which NS teacher speech in Japan sometimes comes to mimic their students’ non-target-like speech. From many perspectives, these items would be considered errors in the sense that they are nonstandard in the teacher’s L1 community. One may be tempted to call them part of a unique dialect reflective of syncretism between various NS dialects and Japanese English learners’ interlanguage, but in my estimation most teachers are unaware that this is happening and continue to see their speech as “standard”. This not only robs students of the models they’re looking for but also limits the abilities of those teachers to explore the issues that hide in the differences between the teacher’s and learners’ understandings of the language. These changes can happen for a few different reasons. In cases of subtle grammatical changes, NS teachers who were never conscious of certain language features may have heard them being used in novel ways and were unable to see and reject them as non-standard. They also may have begun using them out of solidarity with their learners, unable to see how linguistic innovation is sometimes just an error under a different name. They also may have adopted them out of a conscious desire to effect the formation of a Japanese dialect of English like Singlish. In this last case there is nothing wrong with the idea, except that students may not be in on the teacher’s plans and may regard his or her use of, for example “flying start” (a false start in a race) as evidence that that particular lexical item is understood in the teacher’s country of origin rather than part of the teacher’s contribution to recognition of a pidgin dialect in Japanese English. Again, students in Japan reject the idea of a Japanese variety of English and want to learn a native variety, no matter how difficult or impossible this may be. My position is a compromise: NS speech represents a model that learners can gain something from, even if what they gain isn’t native-like abilities. And although I’m about to start my list of Japan-adapted NS “errors”, none of this should be taken as a sign that I embrace the concept of the NS teacher as mainly a model of correct English use or pure cultural representative, i.e. that all accommodations to Japan and Japanese learners’ English act to reduce a NS teacher’s value. First, Japanese English teachers also should know and understand the logic behind these changes and their correct forms in whatever variety they use as standard English. Also, the problem is not change itself but unexamined change and ignorance of what has changed when, for example, a bowl of ramen is described as “very delicious” as opposed to “very good”. This holds true for all English teachers. There is a section of the watershed popular psychology book Thinking, Fast and Slow about the availability heuristic. Loosely, when asked about the frequency of some event, we tend to answer as if we’d been asked how many such events we can remember. Because events like murders or terror attacks are always fresh in mind, we tend to rate them as frequent, although they are not (the death rate from terror in France is much lower than the famously low murder rate in Japan). In fact it is their infrequency among other things that makes them memorable, which in turn makes them easier to recall, which makes them seem more frequent than they really are. The infrequency of an event itself can result in that event seeming frequent. You actually need very few assumptions to come to the conclusion that your instincts will reliably get questions of frequency very wrong. The result of these two factors colluding plus the omnipresence of information and news in modern life is that people vastly overestimate the prevalence of airplane crashes, rare diseases, and Olympic medalists from the country whose news they consume. On a smaller scale, you will judge more prevalent a strange-looking breed of dog you’ve only seen once or twice, a particularly pleasant or unpleasant social encounter you had while visiting a new place, and a bad meal at a restaurant that’s usually good. Of course the converse, that people will underestimate the frequency of mundane or expected events like deaths from heart disease or days without terror attacks, is true as well, and has some warping effects on the public policy choices of our representatives in government, who are beholden to electorates who suffer from these endemic mental processing bugs or suffer from them themselves. This and basically all the other chapters of that book leave you with the inescapable impression that trusting your gut is a terrible decision. Unfortunately it is also a decision that most other people will sympathize with and understand, and is unlikely to lead people to blame you when your illogical choice fails. The temptation to engage as little of your slow-thinking brain as possible comes from both the uncomfortable mental labor involved as well as from people we have to explain our decisionmaking processes to. I was enjoying a fine meal at a vegan café when the conversation between us and the owners turned to English learning. Now, this happens pretty often when you’re an English teacher (or just look like one) as people are reminded by your presence that they nominally took at least 6 years of English at school and have little to show for it. In this case though, the owners of the café were as international a couple as you can have when both members are Japanese, and I didn’t get the sense that they were looking for our help in fueling a navel-gazing session on why Japanese can’t learn English. Still, one half of the couple was in search of learning materials and brought out this book she had bought, wondering what we would think. She seemed to realize that this wasn’t the best use of her money, and when I expressed surprise at the unusual angle the authors were taking for their already-suspicious volume, she said I could just take it. I have to say, I wasn’t expecting a serious academic work, as it’s rarely a sign of quality when the title of a textbook contains exclamation points and the color scheme would, in the wild, indicate the presence of deadly venom. Still, I was intrigued that a mass market book could so prominently feature the concept of “World Standard English”, as this author (Tadashi Yasuda, CEO of something called “Pan-nations Consulting Group”, and self-described “Leder of communication”) calls the concept better known as English as a Lingua Franca (ELF), essentially a set of standards aimed at facilitating English communication between fellow non-native speakers (NNSs). The style presaged by the cover is continued inside with still-greater intensity. From the preface. The section headers read: “This is a book exactly for you, who say ‘I want to speak English! 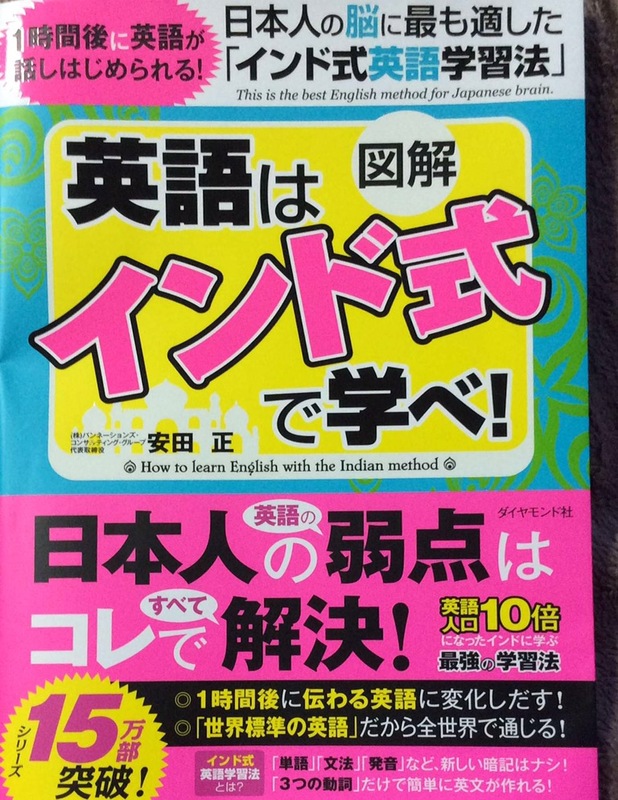 '” and “The English learning methods [practiced] till now have not been suited to the Japanese!”. On one page I counted 18 exclamation points to 5 periods. To be fair, this doesn’t reflect exclamation points at the ends of 18 sentences, as some sentences ended with multiple exclamation points – another bellweather of staid and steady insights to come. 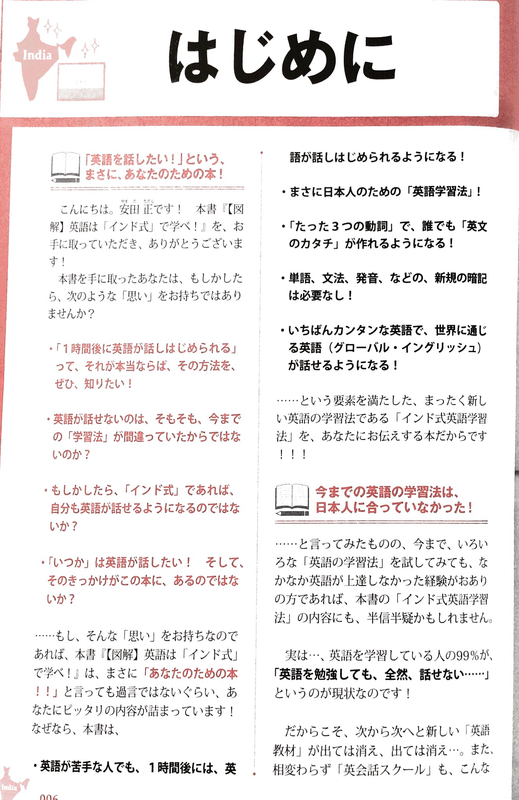 The author is also fond of the dots above letters that indicate emphasis in Japanese, at some points using these above every letter in a sentence. The style in general seems to be of a BBS user from an era before emojis barely containing his impatience while explaining a conspiracy theory. I was wondering how best to organize this review, and after browsing the contents I came to the conclusion that because the book is written for a mass audience and therefore includes reference to a variety of widely-held beliefs and tropes on language and language learning, I would separate my points of criticsm into clichés and non-clichés. This way I can explore the familiar cultural ground on which this book positions itself before seeing what, if anything, is novel about it besides the angle it uses to catch book-buyers’ (and my) attention. Why am I reviewing this?! I should also say before launching into more in-depth content that I know nobody in the respectable ELT world is asking for reviews of the types of language learning books that seem to occupy the same social space as gluten-free brownie recipes and chicken soup-based collections of inspirational stories (the publisher seems to specialize in this genre). However, I think it is important for people whose ideas of language learning involve lots of words like “emergent”, “lemma” and “socio-culturally situated” to remember that most language learners know none of those concepts or really anything about SLA and are flying blind when it comes to choosing materials. As such, they are likely to choose books or methods that seem compatible with preconceived or ambient notions of language learning and are purchased for reasons related more to marketing than to rigor or a history of success. For the same reason I devoted a lot of my time in Japan post-MA to studying eikaiwa, the things that most people actually use to study as opposed to what we think they ought to use deserve the attention of researchers as well. To quote myself, if you want to study nutrition you have to know what people are actually eating. I had a sudden flash of insight this evening while reading reviews of Suicide Squad, thinking to myself how few teenagers waiting for these movies are named “Bruce”. Likewise any “Tony”s watching Iron Man or “Hank”s watching Ant Man (yes, I know the main character was Scott Lang, not Hank Pym). Even if those names are way underrepresented among the current crop of teenagers and young adults, there is a good chance that the next cohort of moviewatchers, this cohort’s kids or grandkids, will include Bruces and Hanks again. The same way that the top baby names for 2016 include names my generation considered antique such as Ethan, Sophia and Charlotte; Ethan and Sophia’s kids might be able to watch X-men and say, “Psylocke’s real name is Betsy? I have 2 Betsys in my class”, a feat last possible in the 1960s. Names are frequently recycled from times of yore in English-speaking societies, perhaps to give an air of historical sophistication and gravitas to the next generation greater than the mundane ordinariness of the names that we’re used to. My generation has a plethora of Mikes and Daves, and the next generation has names that Mike and Dave consider timeless or just old enough to be classy. Of course, that’s how our parents’ generation felt too, which is why Lindas and Freds are so underrepresented among their kids. None of this is so in Japan, where new generations are often given freshly minted names with no apparent precedents. There is very little chance that the equivalent of “Bruce” in Japan will be widely used again in our lifetimes. This fact of naming has implications for the current superhero boom, and helps to explain a bit of the differences between popular heroes in the US and Japan. I started contributing to a comment thread on a facebook post all about Tom Swifties. I just thought I’d repost them here to further aggravate readers who expect something about life in Japan or ELT. “I just dropped off a letter”, Tom posted. “Free hot dogs!”, Tom shared a link. “I am bringing back traditional forms of heating”, Tom repeated. “Cars in Japan have maintenance required by law every 2 years”, said Tom, shaken. “I don’t check sources for tweets”, Tom said ex-post-facto. “I think I just gained a level”, Tom said from experience. “Vin Diesel can’t do sci-fi”, Tom ridiculed. “Should we ban swearing?”, they discussed. “If only more teachers read about task-based language teaching”, Mike said longingly. “We dress our daughter in pink”, Tom engendered. “I will always support my sister”, Tyrion implied. “Try lowering the action”, Tom said, high-strung. “TV needs more Stephen King adaptations”, Tom reiterated. “Hmm, so Alaska’s native people don’t like being called Eskimos”, Tom intuited. “Looks like we’ll need the engine to make it back to port”, said Tom, disgusted. “I can photosynthesize”, Groot believed. “I was named after my grandfather”, I remarked. For curious parties, we’re waiting for a visa interview at this point, and then we’re off to the USA. I just have a few more things to get off my chest before that, this time a continuation of my vast array of complaints about driving here – which manages to kill more than twice as many per mile driven as many countries in Europe. Downer. The high fatality rate is attributable at least partly to the low level of consciousness about seatbelts, while the rate being lower than you’d expect given what I’m about to say is in my mind due to the fact that people are used to the obstacle course that constitutes a 10-minute drive to the supermarket here. The idea that you can shut your brain off and drive in a straight line until the next stoplight is quite foreign, or at least it was until people started getting TVs in their dashboards. I should add the caveat that a lot of what I say is particular to suburban or rural Japan, and that the prefecture in which I experienced most of these has the 4th highest accident rate of all prefectures in Japan (my wife would be dismayed to learn that we are higher on the list than Yamanashi Prefecture, although this seems mostly due to Hamamatsu’s influence). Read on for more road hazards. Many language teachers nowadays put a premium on authenticity. Now, I am aware of all the issues surrounding this term, many of which are the same as the issues surrounding native-speakerism since authenticity to potential learners often means “close to the stereotype”. A lot of native-speaker (NS) English teachers therefore find themselves being expected to exaggerate the differences between them and their students, to act as a representative of not just their country but the version of their country that exists in the Japanese public imagination. Teachers throw the word authentic around a lot too in service of new, student-centered approaches or materials produced by someone other than Cambridge or Pearson. In my career I’ve mostly stuck to the credo that being myself is as authentic as I can possibly be, and if that differs from the stereotype then it’s the stereotype that has to catch up. I’ve been thinking lately though that putting a little effort into playing the role that your students expect, even if their expectation is based on offensive pigeonholing, is a defensible classroom practice. That is, it may pay to prioritize in methodology and content what feels authentic to students over what is true and accurate.